Heian-jungu Shrine is one of the most important and visually impressive Shinto shrines in Kyoto. It’s worth a visit, particularly on Shinto festival days. Like most Shinto shrines, Heian-jingu Shrine is marked by a vermillion torii (shrine gate) out front. But the torii at Heigan-jingu is anything but ordinary: It’s vast. Standing almost 25 meters high, it dominates the entire Okazaki-koen Park area. Interestingly, it’s set so far away from the main compound of the shrine that many people assume it’s completely unrelated to the shrine. Heian-jingu Shrine was built in 1895 to commemorate the 1100th anniversary of the founding of Kyoto as capital of the country and to coincide with an industrial exposition held that year. It’s a 5/8 scale reproduction of the original Hiean Palace (the palace of the early emperors of Kyoto). You can explore the vast gravel strewn open area in front of the main shrine, make wishes at the shrine, buy amulets and fortunes and observe the Japanese as they go through their various religious rituals. There’s a decent garden that you must pay to enter behind the main hall. It’s famous for its cherry blossoms and this is the only time that we really recommend paying to enter the garden. 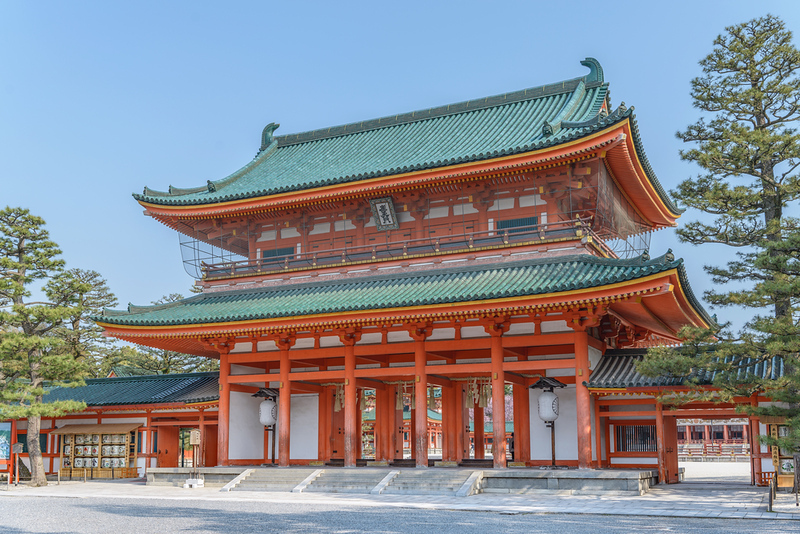 :: Check availability and pricing for hotels near to Heian-jingu Shrine Booking.com or Agoda.com. Heian-jingu Shrine is located in Kyoto’s Northern Higashiyama district. See our complete list of things to do in Northern Higashiyama, including places to eat, nightlife and places to stay.